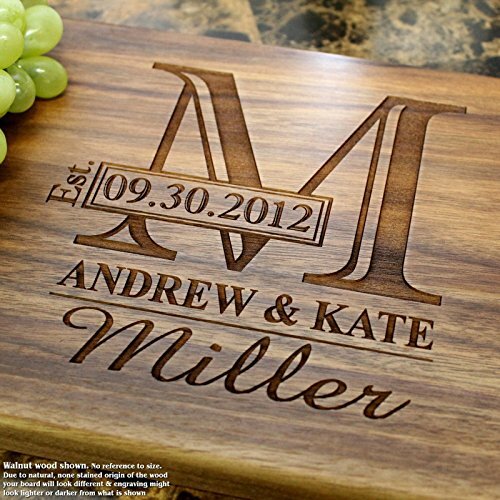 Our personalized cutting boards are engraved with a beautiful design of your choice. They make a perfect gift for a family, couple, friend, or maybe that special someone in your life. Surprise others with a unique wedding, anniversary or housewarming gift. Show your appreciation with a one of a kind party favor for your bridesmaids or groomsmen, friends, or family members. In addition, a personalized cutting board would make an excellent corporate gift for a business partner or a prospective client. We do not include invoices or receipts in the package. ❆ ❆ ❆ ❆ CHRISTMAS DELIVERY CUT OFF IS DECEMBER 10th ❆ ❆ ❆ ❆ HOW TO ORDER: 1. SIZE: Select required size or choose a set from the options provided. Please allow for small size variation due to our commitment to sustainable forestry and the handmade origin of our boards. 2. WOOD TYPE: Choose from Walnut, Maple, Cherry, White Oak or Sapele/Mahogany. 3. PERSONALIZATION: Please enter personalization information for each line according to the "Artwork example". *If you want a line to be excluded, please put "N/A" in the corresponding field. See More Information Below.